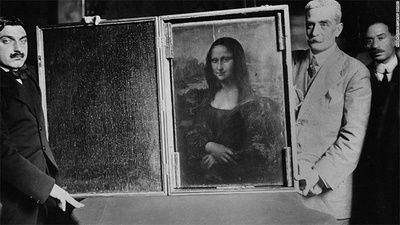 August 21st 1911; an amateur painter sets up his easel near Leonardo da Vinci's Mona Lisa at the Louvre in Paris, only to discover that the masterpiece is missing. The day before, in perhaps the most brazen art theft of all time, Vincenzo Perugia had walked into the Louvre, removed the famed painting from the wall, hid it beneath his clothes, and escaped. While the entire nation of France was stunned, theories abounded as to what could have happened to the invaluable artwork. Most believed that professional thieves could not have been involved because they would have realized that it would be too dangerous to try to sell the world's most famous painting. A popular rumor in Paris was that the Germans had stolen it to humiliate the French. Investigators and detectives searched for the painting for more than two years without finding any decent leads. Then, in November 1913, Italian art dealer Alfredo Geri received a letter from a man calling himself Leonardo. It indicated that the Mona Lisawas in Florence and would be returned for a hefty ransom. When Perugia attempted to receive the ransom, he was captured. The painting was unharmed. Perugia, a former employee of the Louvre, claimed that he had acted out of a patriotic duty to avenge Italy on behalf of Napoleon. But prior robbery convictions and a diary with a list of art collectors led most to think that he had acted solely out of greed. Perugia served seven months of a one-year sentence and later served in the Italian army during the First World War. The Mona Lisa is back in the Louvre, where improved security measures are now in place to protect it.